Stone Cottage Adventures: Would You Like to be an Engineer? They get to wear really cool hats! The Great Blog Train is expanding and looking for some new Engineers! 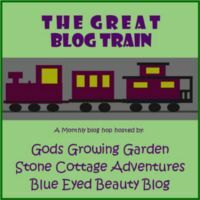 ﻿You might be asking, "What is The Great Blog Train?" It is a monthly blog hop departing from your online train station on the first Wednesday of every month! Would you like to join us? Just complete the form and we will choose our Expansion Team!